Anne Spirn diagrammed the difference between a natural, closed system landscape and the urban landscape, which requires constant inputs and produces unwanted outputs, in The Granite Garden. A conventional farm is similar to the urban landscape in this way - requiring a steady stream of inputs and resulting in secondary outputs (wind blown soil, nutrient loaded runoff). 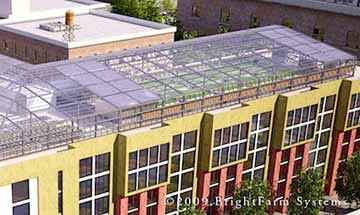 Integrating an agricultural program with low-income housing in the South Bronx, a proposed rooftop garden attempts a closed-system urban agricultural landscape. 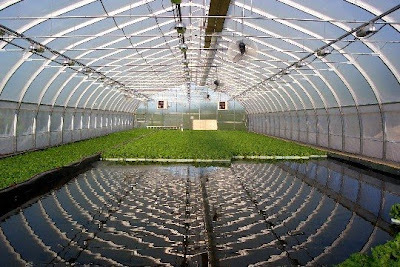 The 10,000 square foot greenhouse plans to use residual heat from the building and harvest rainwater to grow year-round vegetable crops. The project estimates they will be able to meet the produce needs of 450 residents. As the development consists of only 100 units, it has, intentionally or not, been sized to meet its food print. Designed by BrightFarm Systems, the farm will be a hydroponic system, in which plants grown in a water based nutrient mix, and is one of several similar projects they have underway. Growing without soil is an idea with a long history. Sir Francis Bacon is credited with the first publication on hydroponics, with the 1627 book Sylva Sylvarum. In fact, the entire history of hydroponics, as briefly outlined here, has such fascinating ties with the surreal landscape that it's worth a brief digressionary tour, including the hydroponic farm at Wake Island used to feed passengers aboard Pan Am planes as they stopped to refuel, the early experiments of a British naturalist with growing spearmint in water to find that less pure water sources grew better plants and Epcot's Land Pavilion which featured hydroponic techniques. Back to the integrated urban agricultural system at hand - the beauty in this idea lies not only in addressing food requirements as part of development planning, but in the approach to creating a closed system in which waste is reduced. The greenhouse will rely on solar panels to create power, capture rainwater for the hydroponic system and make use of heat produced by the building itself. The South Bronx project will make use of 750,000 lites of captured storm water that would have otherwise been diverted to storm drainage systems. Even better, yields on crops grown in hydroponic systems are higher than yields from traditional crops, which is partially attributed to the ready availability of nutrients and water to the plant. A similarly appealing water-based closed-system food production system was presented by Materials & Applications in San Francisco recently, in which they described the temporary aquaponic tilapia farm they installed in their studio. 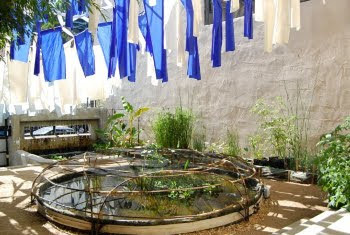 Rainwater provided the initial water for the farm, and gravity and solar energy powered the filtering system in which farm water circulated from the fish tank through a series of planted pools for cleansing. In both cases, the potential for designing closed system urban food systems as an rich architectural exploration is revealed.